Not the cheapest 1080, but the cheapest I have seen this card. Good price for a 1070: £350Good price for a 1070ti: £400Good price for a 1 …Good price for a 1070: £350Good price for a 1070ti: £400Good price for a 1080: £450This one is a bit expensive. It's a MSI Gaming X model, which usually sells for £550+. Just because all the shite Gigabyte 1080's have been lower, doesn't mean this isn't a good price. This one is a bit expensive. I paid £420 for the 1070 Gaming Z back in May. It's a monster card, had to replace my pc case and it was still a squeeze. Good card though, paired with a pentium G4560 which I'm sure bottlenecks it.Might have stretched to the 1080 had it been this price back then. I paid £500 yesterday for the AORUS version of the 1080 so i would say this is a good deal for a non-blower style card. Not £45. Not £54. Exactly £50 between cards regardless of their specs. Is this a good version of the card and a good deal anyone? or is this one better for the higher price? or are there better deals out there ? Is this a good version of the card and a good deal …Is this a good version of the card and a good deal anyone?https://www.newegg.com/global/uk/Product/Product.aspx?Item=N82E16814487387&ignorebbr=1or is this one better for the higher price?https://www.scan.co.uk/products/msi-geforce-gtx-1070-ti-gaming-8gb-gddr5-vr-ready-graphics-card-2432-core-1607mhz-gpu-1683mhz-boostor are there better deals out there ? 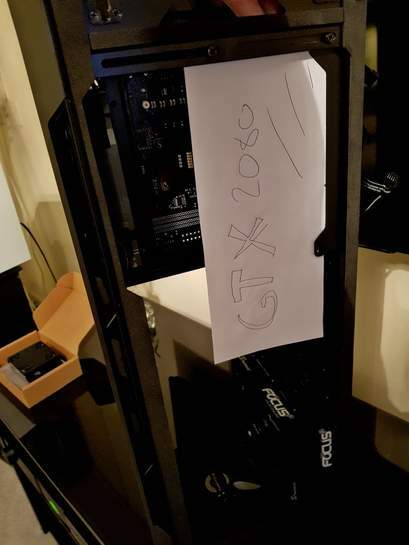 How long is the warranty for this GPU in the UK? I called them and they said that I need to check with MSI directly. On the MSI website it says "Depending on territoryRegional differences may apply. Please enquire with the original shops or our local offices." Bought one today. Great card with best cooling. When these new 11gb variants came out, I saw a Linus video benchmarking old Vs new and the difference was a percent or 2. Whichever is cheaper imo. Has anyone had to warranty a MSI card? What is their support like for us in the UK? Has anyone had to warranty a MSI card? What is their support like for us …Has anyone had to warranty a MSI card? What is their support like for us in the UK? How long is the warranty for this GPU in the UK? 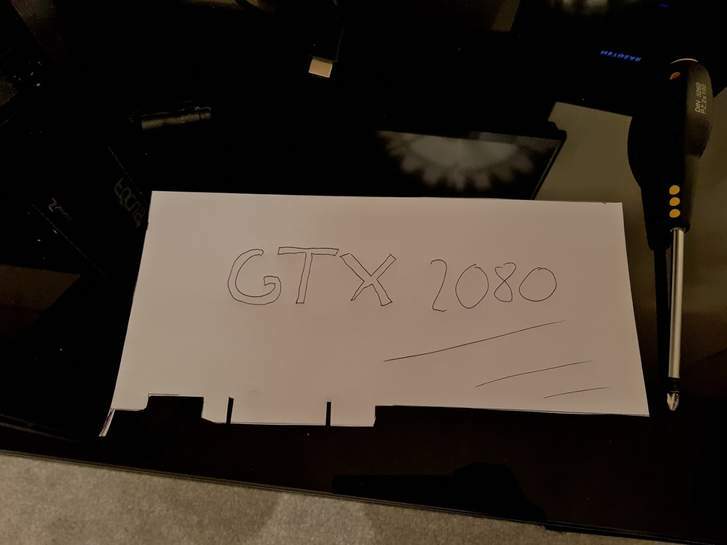 I called them and they …How long is the warranty for this GPU in the UK? I called them and they said that I need to check with MSI directly. On the MSI website it says "Depending on territoryRegional differences may apply. Please enquire with the original shops or our local offices. "Anyone knows? It's 3 years for MSI GPUs. Always deal with the retailer. 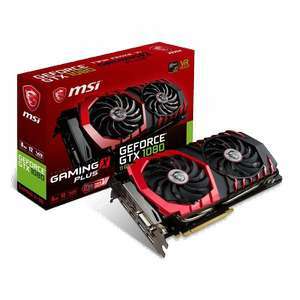 MSI graphics cards are sent to Netherlands for repair/replacement 30 days after purchase, before that as with any purchase you can get a full refund or direct replacement from the retailer in question. From the link I posted above, either I've mis-understood the MSI site, or that list is wrong in regards to UK RMA being in the Netherlands. That list was first created in 2011, but has been updated this year so I'm not sure. Recent experiences from a UK RMAer would be great. Yeah this table is what I’ve always referred to with GPUs, which is why I wondering if there’s been any changes/how their support is? I’m guessing although their website says Coventry, they ship it to the Netherlands to repair? From the link I posted above, either I've mis-understood the MSI site, or …From the link I posted above, either I've mis-understood the MSI site, or that list is wrong in regards to UK RMA being in the Netherlands. That list was first created in 2011, but has been updated this year so I'm not sure. Recent experiences from a UK RMAer would be great. Yeah it's me who created the list. 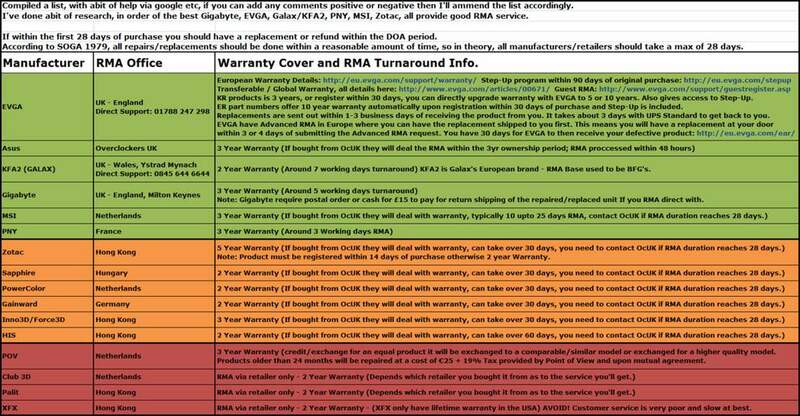 I'm almost certain that the UK RMA is for laptops. Yeah this table is what I’ve always referred to with GPUs, which is why I w …Yeah this table is what I’ve always referred to with GPUs, which is why I wondering if there’s been any changes/how their support is? I’m guessing although their website says Coventry, they ship it to the Netherlands to repair? I've got another list just for Overclockers UK, because they have some better RMA terms in particular with ASUS, they actually deal with the RMA's for them if you purchased an ASUS graphics card or motherboard through Overclockers UK. Whoa, you're the person who made the list!? That's awesome haha. Thanks for your time making that, It's been my go to table for GPU shopping! Do you have a source for the laptop only claim? I'm not saying you're wrong, but I have an MSI GPU and it would be nice to have full confirmation if it is indeed UK RMA or not. Thanks. Do you have a source for the laptop only claim? I'm not saying you're …Do you have a source for the laptop only claim? I'm not saying you're wrong, but I have an MSI GPU and it would be nice to have full confirmation if it is indeed UK RMA or not. Thanks. From previous RMA's, from people who have gone direct through MSI their RMA base for motherboards and graphics cards is based in the Netherlands. Components, such as for mainboards, VGA cards and multimedia peripheral devices should be returned to the place of purchase. 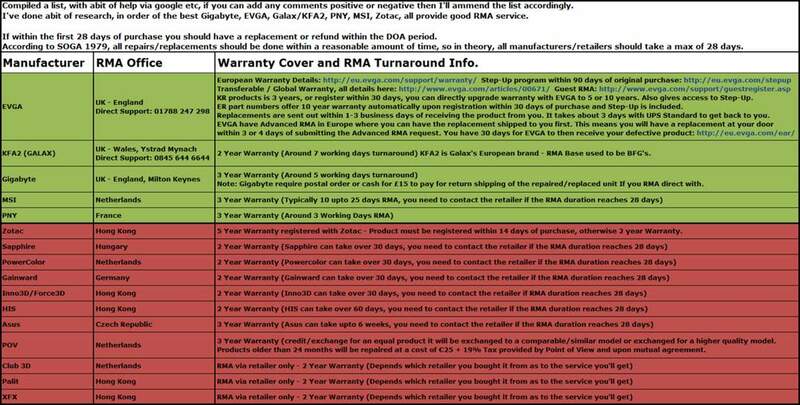 There is no direct RMA to MSI available. The reseller will request RMA. How very arbitrary. Not £45. Not £54. Exactly £50 between cards re …How very arbitrary. Not £45. Not £54. Exactly £50 between cards regardless of their specs. By all means, I am not going to stop you from buying a 1080 for £490. I was just saying what a good deal is and this one is not one of those. Also you can use your own judgement whether it's worth buying a 1080 for £490 that provides you with a wee bit more performance than a 1070ti for £409 or £419 if you want an MSI. You can buy a Palit or a Zotac 1080 for at least 10-15-20 less on Amazon. Are these good deals? Not in my opinion because the amount of cuda cores you get for the extra cash is not really justifiable. However since we do not have a time machine and cannot get the 1080s for 430 from Amazon and ebuyer at the moment. These are probably the cheapest ones. Should you wait because they will be available cheaper? I would say yes. I managed to bag a few 1070ti's for £400 each. Is that a good deal? Definitely. My "good deal" scale might be arbitrary but I'm not spending more money on something that is available cheaper on a bimonthly basis. It's hotukdeals after all and not OMG it's a 1080, buy buy buy! Only my two pennies, please ignore my comment and spend your money. Gobble gobble! By all means, I am not going to stop you from buying a 1080 for £490. I …By all means, I am not going to stop you from buying a 1080 for £490. I was just saying what a good deal is and this one is not one of those. Also you can use your own judgement whether it's worth buying a 1080 for £490 that provides you with a wee bit more performance than a 1070ti for £409 or £419 if you want an MSI. You can buy a Palit or a Zotac 1080 for at least 10-15-20 less on Amazon.This from Nova: https://www.novatech.co.uk/products/zotac-geforce-gtx-1080-mini-graphics-card/zt-p10800h-10p.htmlScan: https://m.cclonline.com/product/231997/NEB1080U15P2-1045D/Graphics-Cards/Palit-GeForce-GTX-1080-Dual-8GB-OC-Graphics-Card/VGA3808/Are these good deals? Not in my opinion because the amount of cuda cores you get for the extra cash is not really justifiable. However since we do not have a time machine and cannot get the 1080s for 430 from Amazon and ebuyer at the moment. These are probably the cheapest ones. Should you wait because they will be available cheaper? I would say yes. I managed to bag a few 1070ti's for £400 each. Is that a good deal? Definitely. My "good deal" scale might be arbitrary but I'm not spending more money on something that is available cheaper on a bimonthly basis. It's hotukdeals after all and not OMG it's a 1080, buy buy buy!Only my two pennies, please ignore my comment and spend your money. Gobble gobble! Holy assumptions Batman. When did I say I was spending any money? No hard feelings matey, I just hope not many people made the wrong decision here. "The wrong decision". Always nice to have an opinion and some where to give it life. Both the Palit and the Zotac cards you link to have slower core clock and memory clock speeds. One is £19 cheaper and the other £22. The choice everybody makes when buying any graphics card is difficult, so many different cards even in the same class and by the same company. Follow this link and you will see half way down the page a list comparing the 5 MSI GTX1080 GAMING cards. This one is the last one in the list, technically the best one and currently the cheapest one I am aware off. Will I be able to buy this card cheaper in the future - yes, as with most PC stuff. So please share with us lesser beings your greater knowledge and post a better deal. When you factor in the possible 3% cashback, and the £30 you could get for selling Destiny 2 the card costs about £445 which is a great price for such a well reviewed card. When you factor in the possible 3% cashback, and the £30 you could get for …When you factor in the possible 3% cashback, and the £30 you could get for selling Destiny 2 the card costs about £445 which is a great price for such a well reviewed card. You can sell the codes, but only to those with a GTX 1080 or 1080ti. That's what the article means by 'qualifying GPU'. Then I start dithering thinking oh but there will be new cards next year. Well I haven't had a GPU since 2014 and I can't keep waiting. Ordered, neatly bought a 1070Ti for £420 but if i'm spending this much I …Ordered, neatly bought a 1070Ti for £420 but if i'm spending this much I might as well get the 1080,Then I start dithering thinking oh but there will be new cards next year. Well I haven't had a GPU since 2014 and I can't keep waiting. With the free game and cashback it works out less than a 1070Ti, so anyone would be daft to buy a 1070Ti right now tbh.